The contents of chlorophyll (Chl) and carotenoids (Car) per fresh mass were lower in shade needles than in sun needles. Ribulose-1,5-bisphosphate carboxylase (RuBPC) activity and contents of soluble proteins were also significantly lower in shade needles. 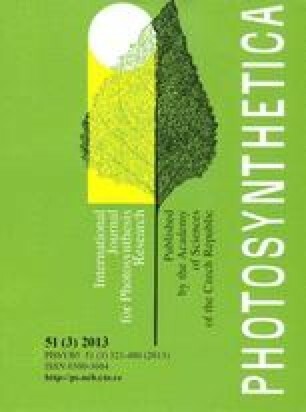 In isolated thylakoids, a marked lower rate of whole chain and photosystem (PS) 2 activities were observed in shade needles. Smaller lower rate of PS1 activity was also observed in shade needles. The artificial exogenous electron donors, diphenyl carbazide (DPC) and NH2OH, significantly restored the loss of PS2 activity in shade needles. Similar results were obtained when Fv/Fm was evaluated by Chl fluorescence measurements. The marked lower rate of PS2 activity in shade needles was due to the lower contents of 47, 33, 28–25, 23, and 17 kDa polypeptides. This conclusion was confirmed by immunological studies showing that the content of the 33 kDa protein of the watersplitting complex was diminished significantly in shade needles.